This is my primative website...sound and noises on the way soon! I have this strange hobby (along with others) of building BBQ Pits. My first build was a made with a beer keg and then a box. There must have been at least 6 or 7 of these things in use. Good and cheap......got a lot of folks cooking out. 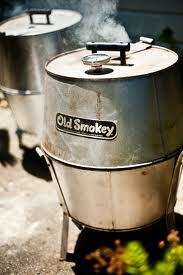 Spent about 10 years with the Old Smokeys. Then things kind of got out of hand. There is no cure for the fever, it just keeps on burning. Look what happened next! About the same time my brother told me about this thing called Craigslist! That's when things really got out of hand. Responed to a Craigslist ad from Ryan, he had some 500 gallon tanks, great shape, etc. I heard a voice one day that said go to Craigslist... so I did. The fire box has the fire bricks in, grates with handles in, door handle on and locking wrench installed! New push buttons arriving soon.....BBQ adventures!